Well, I finally did it……it was difficult but not as painful as I expected…..but still a little scary. What am I talking about here? I know, I know that’s not a big deal to the mainstream world but I don’t even own an E-reader(Yes, I borrowed one). I am technologically challenged at best. I enjoy the feel of a real book in my hand and turning pages and needing some sort of light to read by. Now all that being said, I survived so I will keep moving forward from here. Now I thought I was well versed in the history of our beloved game but I was sadly mistaken. 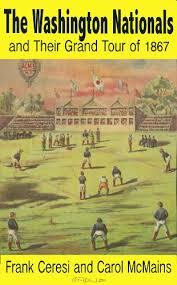 This little book takes you through some of the earliest documented stages of our “National Pastime”. It discusses the social impacts that Baseball had on Civil War America and how it was a morale booster for the soldiers. It discusses the conditions in which they played and rules they played by of which I did not know scores of over 100 per game were commonplace. Finally it discusses the post war “Grand Tour” of the Senators into the expanding now Mid-West United States and how through that Grand Tour they were able to expose countless people to the charm of Baseball. You notice some more famous names from Baseball history such as A.G. Spalding involved with this promotional tour as well. But the most fascinating thing I found with this book was the progression of the rules and how they have changed in current Baseball. Also that the players used to have to pay to participate in the league instead of getting paid, which is a far cry from today’s Baseball. Another fascinating aspect of this book through some of the activities is that you can start to see some of the groundwork being laid for the current American League teams. So I bet if it researched back far enough you could find some sort of tie to these teams of yesteryear with our current teams. The only two things that I found disappointing about this book is first, that just as today it is true, the New York teams were the strong and dominant team. The second one is that this is not a printed book because I would love to have a hard copy in my collection. Overall it is a good read that gives some insight into a long forgotten time that would be informative and enjoyable for the history buffs. If you have an interest in 19th century Baseball and have an E-reader this may be worth looking into for you. This e-book can be found at http://www.miniverpress.com and is very affordable.